The Greeks were not the first to have a ‘Mount Olympus’ where their pantheon of gods resided. Long before them, the Ancient Egyptians had their own version of Mount Olympus, but it was neither located in Greece nor Egypt. 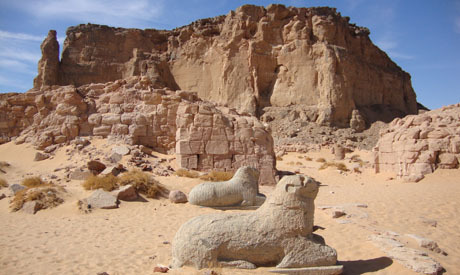 Named Gebel Barkal, the holy mountain in Sudan served as the place where the god Amon lived. The Kushite Kingdom is in fact two kingdoms: one that had its birth pangs around 2500 BC and underwent a serious downfall in the mid-second millennium BC when its political power alarmed its Egyptian neighbours, and a second kingdom that rose in the mid-eleventh century BC and lasted till the fourth century AD. Crossing the Bayuda Desert, we slowly approached the first of five archaeological sites collectively known as Gebel Barkal and the Napata Region. Napata was the capital of Kush between the eighth and third centuries BC, lending its name to the flourishing Napata culture. This very same spot was the birthplace of the Black Pharaohs that ruled Egypt between the eighth and seventh centuries BC. “I shall make Egypt taste the power of my hands,” said Piankhi before conquering Egypt. The first site we visited was El Kurru, the oldest pyramid field in Sudan and the resting place of all the legendary kings of the 25th Dynasty (except Taharqa). There is an interesting story, starting in present-day Sudan and unfolding in Egypt. It all started with the attempt to unite Upper Nubia under Alara and his successor Kashta. The reign of Piankhi in the eighth century BC would be a defining moment, not only for the Kushite Kingdom, but also for Egypt. Seeing how divided and politically fragmented Egypt was at the time, Piankhi decided to invade it around 730 BC, uniting the area and establishing his rule over Upper and Lower Nubia, becoming the first Black Pharaoh. Following his success, he opted for returning to Napata. Piankhi's pyramid is the oldest in Sudan, and the first to be erected in some 500 years (after the last Egyptian pyramid had been built).Then followed his successors, the most prominent of whom was the legendary Taharqa. The pyramids at El Kurru are in poor shape, most of them reduced to rubble. The one star attraction is the burial chamber of the last Black Pharaoh: Tantamani. The coloured paintings and the star-sprinkled ceiling are of exceptional quality (excluding a comparison to their Egyptian counterparts). Then came another site, one at which we can resume the story of Taharqa and the Black Pharaohs, namely the site of Nuri. Taharqa was the promoter of an urban renaissance and a golden age in Egypt, but he had to face a ruthless enemy – the Assyrians. Following an initial confrontation and a humiliating defeat, he eventually had to withdraw to Kush where he would never set eyes on Egypt again. Following Taharqa, Tantamani made a brief attempt to take control of Egypt again, but with no success. The reign of the Black Pharaohs came to an end, leaving behind a legacy that can be best appreciated at yet another site – Gebel Barkal. One can easily imagine why this mountain (a hill) inspired so much awe among the Pharaohs and the Kushites alike. Its location close to the Nile and the protrusion of a pinnacle at its front that resembles the ancient cobra (uraeus, symbol of kingship) gives it an air of mystery, while the view from its top is unbeatable. Sacred to the Ancient Egyptians as far back in time as the New Kingdom (some 3,500 years ago), it was believed to be the dwelling of the god Amon. Temples were erected in his honour. Excavations at the site have revealed that at least nine temples were built there, turning the region of Napata into one big ceremonial / religious complex. Today, one can still marvel at what remains of the Temple of Amon, still standing at the foot of Gebel Barkal, best seen from the mountain top. First erected by Thutmose III, it was later enlarged by several rulers, especially by Piankhi. The remaining pillars and the avenue of rams suggest that an avenue might have extended all the way to a pier on the Nile. Other interesting features at Gebel Barkal are the chambers hollowed out in the mountain wall, with depictions of Horus, Apedemak, Bes and other deities, forming part of ancient temples. All around, half-excavated relics of palace complexes and royal residences can be visited, attesting to the significance that this site once enjoyed. A nearby ‘compact’ museum offers interpretations and displays a collection of artefacts and objects found during the excavations carried out at the site. “It remains to be sacred," murmured our Sudanese driver as we started our ride to the camp. He went on to explain “to Muslims I mean. A local saint was buried here, and the place still attracts people seeking the saint’s blessings.” This explains the local name given to the mountain – Gebel wad Kasrani. The reinvention of sacredness of some places by one culture after another over successive millennia is captivating. "Seeing how divided and politically fragmented Egypt was at the time, Piankhi decided to invade it around 730 BC, uniting the area and establishing his rule over Upper and Lower Nubia, becoming the first Black Pharaoh." Hmm...Narmer, the 1st king/pharaoh of the dynastic period was what then? Google bust of Narmer for the answer. Get the facts together man. Is there any evidence of life Moses. Was the Pharaoh of Moses Black or White. HAVE YOU SEEN JESUS PORTRAITS BY WESTERNERS ? If you look at Jesus paintings by western painters, he looks like a blonde man with white skin and blue eyes. Aren't you surprised? Of course, you are. Since Jesus was born as a Jew living in Palestine, thus his hairs were black, his skin was dark and his eyes were black too. Therefore, if you ask a western historian about that Pharao's color of skin, he will respond that his skin was white, his eyes were blue and his hairs were blode. Perhapse, his dad was a British Colonialist guy!! Moses supposedly lived and died over 500 years before the Black Pharaohs took control of Egypt.